Hey Arnold! was a Nickelodeon cartoon that ran from 1996 to 2004. Creator Craig Bartlett started Hey Arnold! as a comic in 1986. Before shooting the pilot, which appeared as a short before the Nickelodeon movie Harriet the Spy, his resume included animating the claymation Penny shorts from Pee-Wee's Playhouse and working as a story editor on Rugrats. Shout! 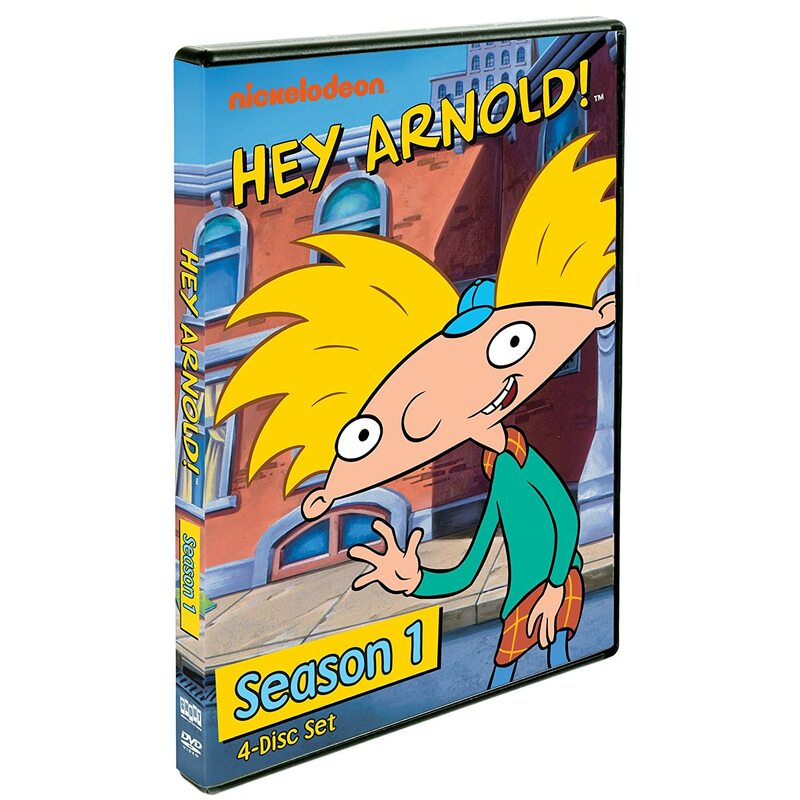 Factory has released Season One of Hey Arnold!, which features 20 episodes across four discs. The series is about the misadventures of fourth-grader Arnold (voiced in the first season by Toran Caudell), who lives with his grandparents (voiced by Simpsons cast members Dan Castellaneta and Tress MacNeille) at their boarding house in the fictional city of Hillwood along with his pet pig Abner. Arnold's most noticeable feature is his football-shaped head, though he doesn’t stand out as all the other kids in the neighborhood have unusual features also. His best friend Gerald (voiced by Jamil Walker Smith) has an odd skull where the top extends up like a broomstick. Unibrowed Helga (voiced by Francesca Marie Smith) is a tomboy and a bully. She's especially mean towards Arnold, but that's to mask her deep affection for him. Each episode contains two stories, except for the Christmas and Valentine's Day episodes. The writers do a very good job balancing adventures that children can identify with through either their realism (Arnold and friends go looking for his lost pet in "Abner, Come Home") or their imagination (The crew search for pirate treasure in "Wheezin' Ed"). The episodes can be silly, like "Downtown as Fruits" where Arnold and Gerald wander downtown dressed as a banana and a strawberry after skipping out on Helga's play, or offer lessons coming off too preachy, such as when Frankie the "Cool Jerk" wants Arnold to help him rob a store. While not cutting edge nor were they trying to be, the show's simplicity and straightforwardness will be appealing to some adults, especially if watching with their kids. Unfortunately, the Hey Arnold! Season One set contains no extras, not even the pilot, though that was reworked into "24 Hours to Live," an episode where Harold challenges Arnold to a fight.